In the products liability case of Mendoza v. Electrolux Home Products, Inc., No. 4:17-02028 (M.D. Pa. Aug. 20, 2018 Brann, J. ), the court reviewed various personal jurisdiction issues and denied a Plaintiff’s Motion for a Re-transfer of a Case. Of note, the court ruled that, since an argument of a lack of personal jurisdiction is waivable, and given that the Defendants had consciously waived personal jurisdiction issues in this matter, the Plaintiffs could not rely upon the lack of such jurisdiction to support a re-transfer of this action. 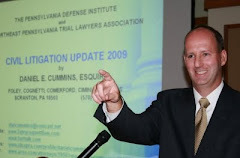 Judge Brann otherwise held that Defendants that have registered to do business in Pennsylvania thereby consent to the exercise of personal jurisdiction by Pennsylvania courts. Judge Brann additionally reviewed Pennsylvania cases in this context and found that cases interpreting Pennsylvania’s long arm statute have not been abrogated by more recent United States Supreme Court precedent. Anyone wishing to review a copy of this case may click this The court's Order can be viewed HERE.